As a subject for a novel the road trip – or rail trip in the case of “Laikonik Express” – but in his full length debut Nick Sweeney has injected new life into the genre. I’ve tended to avoid road trip writing of late: somehow the trips are never nearly as interesting or exciting as my own. In “Laikonik Express”, though, I found a setting almost tailor-made for my own travel predilections, characters that I found both credible and engaging and more than its fair share of wry humour. The story is simple yet as multi-layered as you want it to be. Nolan Kennedy, a young American teacher of English living and working in Istanbul has to find his friend (and alcoholic) Don Darius, a writer of sorts. Nolan has found a manuscript in the bin, an unfinished novel penned by his friend. Nolan is struck by its greatness and, determined to see it published; he sets out to persuade Don Darius to do something about it. The trouble is that Don Darius has gone off in search of a woman he met on a train journey through Eastern Europe on the Laikonik Express; unless he does, he won’t be able to write. Nolan has to find him. You can use all the clichés in the book to describe “Laikonik Express” – road (or rail trip), coming of age novel (though admittedly the protagonists aren’t exactly gap year travellers), a story of friendship, of discovery…and it is all of those but “Laikonik Express” has such an original voice that it transcends all those descriptions and comes into a class of its own. The style of narration is slick and cool; there’s almost a beat voice going on and there’s plenty of insight without too much introspection. There are shades of Hunter S. Thompson, of Kerouac and even Salinger but Sweeney does have a clear, distinct voice. 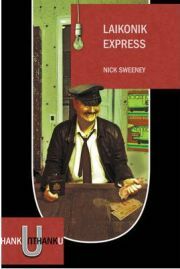 Don’t believe the hype: descriptions of “Laikonik Express” as a “Sideways with vodka” don’t do Sweeney’s book justice. This is a road-trip for the slacker generation: if you must compare it against a film, it’s what “Before Sunrise” would have been like had Jesse and Delphine been as cool as they thought they were. But, more than that, this is the real Eastern Europe and Sweeney totally captures the settings. This is every train trip I’ve been on in the Balkans, and every grimy down at heel post communist town I’ve visited. I love that Sweeney writes about the “real” places, this isn’t a travelogue and he’s no literary tour guide. It’s obvious that Sweeney knows this part of the world, so brilliantly does he capture the essence of these places, but he happily avoids presenting a thinly disguised version of his own experiences. I loved the relationship between Don Darius and Nolan; I loved the way their committed attitude to finding Don Darius’s mystery woman negates the fact that probably both are using the trip to avoid doing anything more useful or important. It’s interesting that Nolan makes the trip for Don Darius: I didn’t get a feeling that there was much solidity in their friendship which makes all the more interesting that he goes to such lengths for the writer. I’m not sure that the nature of their friendship was explored as fully as it could have been. With other characters, too, I felt that the development was slightly lacking but it didn’t spoil my enjoyment. The narration is peppered with cultural references which work for the most part but were occasionally lost on me. Perhaps because I found I identified so much with the author, the characters and the settings I was prepared to go along with this in spite of it becoming a little tedious and show-offish in places. Atmospheric, hugely funny and poignant where it needs to be “Laikonik Express” – even the name makes me smile – is a remarkable debut. This is a book I will read again and again. Thnaks to Unthank Books for providing a review copy. One Comment on "Laikonik Express"